In the above parallelogram, is acute. Which is the greater quantity? Since is acute, a right triangle can be constructed with an altitude as one leg and a side as the hypotenuse, as is shown here. The height of the triangle must be less than its sidelength of 8 inches. The height of the parallelogram must be less than its sidelength of 8 inches. Note: These figures are NOT drawn to scale. Refer to the parallelograms above. Which is the greater quantity? 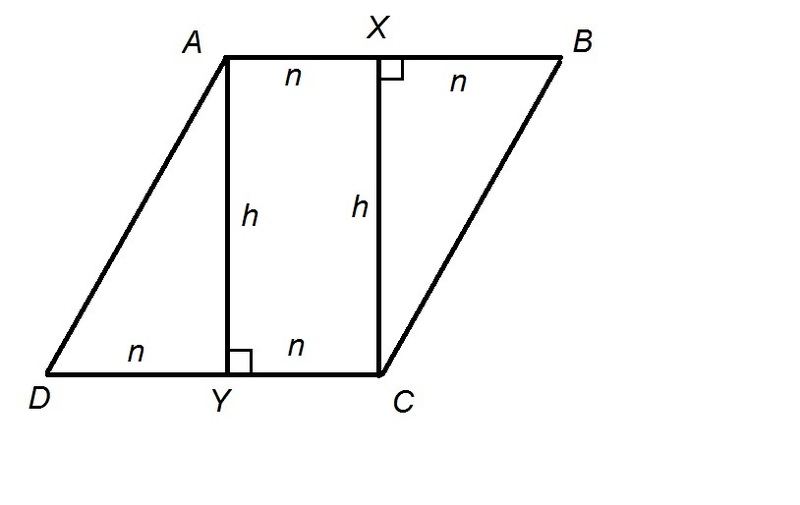 The area of a parallelogram is the product of its height and its base; its slant length is irrelevant. Both parallelograms have the same height (8 inches) and the same base (1 foot, or 12 inches), so they have the same areas. The above figure shows Rhombus ; and are midpoints of their respective sides. Rectangle has area 150. Give the area of Rhombus . We will assign to the common length of the four half-sides of the rhombus. Also, both and are altitudes of the rhombus; the are congruent, and we will call their common length (height). The figure, with the lengths, is below. 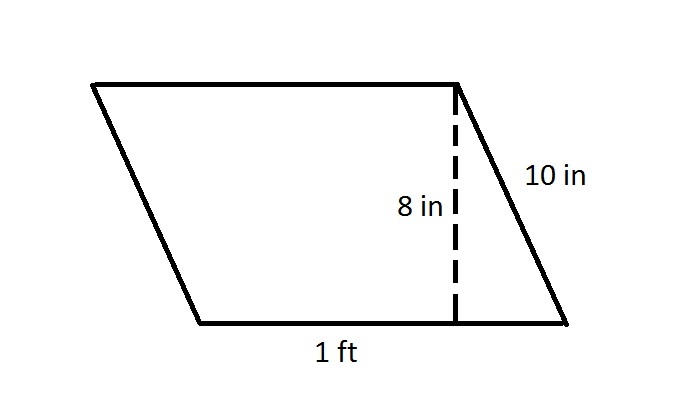 The perimeter of a parallelogram is the sum of its sidelengths; its height is irrelevant. Also, opposite sides of a parallelogram are congruent. The above figure depicts Rhombus with and . Give the perimeter of Rhombus . All four sides of a rhombus have the same length, so we can find the perimeter of Rhombus by taking the length of one side and multiplying it by four. Since , the perimeter is four times this, or . Note that the length of is actually irrelevant to the problem. In Parallelogram , and . Which of the following is greater? In Parallelogram , and are adjoining sides; there is no specific rule for the relationship between their lengths. Therefore, no conclusion can be drawn of and , and no conclusion can be drawn of the relationship between and . Which of the following can be the measures of the four angles of a parallelogram? Opposite angles of a parallelogram must have the same measure, so the correct choice must have two pairs, each of the same angle measure. We can therefore eliminate and as choices. , so we can eliminate this choice. ; this is the correct choice. 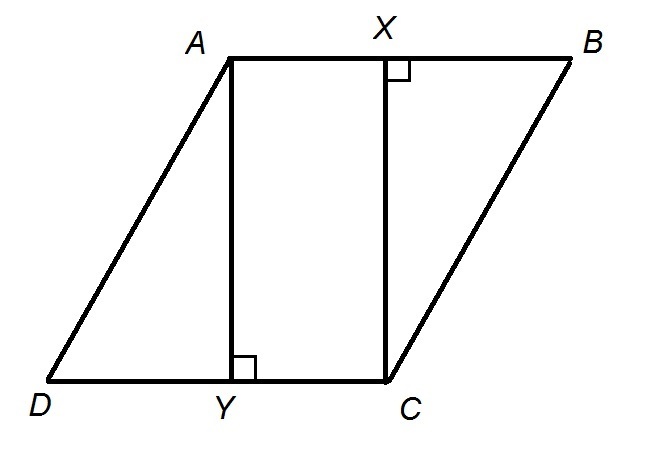 Refer to the above figure, which shows a parallelogram. What is equal to? Not enough information is given to answer this question. The sum of two consecutive angles of a parallelogram is . 157 is the correct choice. In Parallelogram , and . Both are positive, so .